Nathan Hystad has now produced three trilogies following humanity’s reach out to the stars. The first two, Explorations: First Contact and Explorations: Through the Wormhole dealt with humans obtaining the ability to move out into the stars. 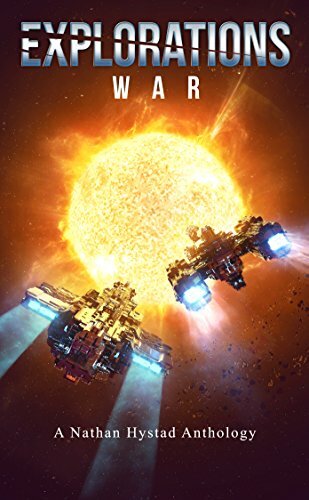 The latest, Explorations: War, reveals that humans have an ancient enemy, a star called Emperyan. This is a rather bizarre concept, that stars are sentient beings. Then again, ancient civilizations worshipped the sun and the moon. But Emperyan is really a sentient being, controlling several alien species to send them against the human race. It begins with a prologue by Hystad, who shows the sun mysteriously dimming and throwing off powerful flares at an accelerated rate. It turns out Sol is trying to defend itself from attack. Soon, Earth is devastated, and Emperyan’s origins are revealed. To the reader. No one in this collection is ever aware of their worst enemy’s birth or the reasons behind its hatred of the human race. Some of the stories are harrowing, men and women sacrificing their lives in horrific acts of bravery. The stories are by authors who all haved a talent for hard science fiction with an amazing consistency in worldbuilding done by multiple writers.